Walsh, David. 2018. The cult of Mithras in late antiquity: Development, decline and demise ca. A.D. 270-430. Leiden: Brill. In The Cult of Mithras in Late Antiquity David Walsh explores how the cult of Mithras developed across the 3rd and 4th centuries A.D. and why by the early 5th century the cult had completely disappeared. Contrary to the traditional narrative that the cult was violently persecuted out of existence by Christians, Walsh demonstrates that the cult’s decline was a far more gradual process that resulted from a variety of factors. He also challenges the popular image of the cult as a monolithic entity, highlighting how by the 4th century Mithras had come to mean different things to different people in different places. David Walsh, Ph.D. (2016), University of Kent, is a lecturer in Classical and Archaeological Studies at that university. He has published articles on the cult of Mithras and on the fate of temples in the Roman provinces of Noricum and Pannonia. Mazhjoo, Nina. 2018. Ritualized body and ritualized identity: Recontextualizing the initiation rituals of the Roman mystery cult of Mithras. Chronika 8, 57-63. Being one of the Roman mystery cults, Mithraism was organized around particular initiation rituals, which all new initiates had to pass before entering the Mithraic brotherhood. Relied on Bell’s concept of “redemptive hegemony,” this research examines the aim of Mithraic initiation rituals in relation to cultic hegemony and the redemption promised by the Roman mystery cult of Mithras. This paper argues that how the initiates internalized the cultic concepts and doctrine through ritual performance and acquired a ritualized body and a ritualized identity. Here, I suggest that the Mithraic ritualization was a social process that legitimized the cultic hegemony within the ritualized bodies and sustained the hierarchical power structure and secrecy of the Mithraic brotherhood. Lahe, Jaan. 2017. Zu möglichen Verbindungen zwischen römischem Mithras und iranischem Mithra. Zeitschrift für Religionswissenschaft 25(2). 233–262. From the end of 19th century, when the Roman Mithras cult was first studied, a discussion about the cult’s links to the Mithra cult in the Iranian religion has been on-going. Positions regarding the links between the Mithras cult and the Mithra cult can be divided into three groups: 1 the Roman Mithras cult is identical to the Iranian Mithra cult and thus the Mithras cult is an import from the Iranian cultural space; 2 the Roman Mithras cult is new and developed during the time of the Roman Empire and also integrated certain elements of Iranian religious heritage; 3 radical standpoint that views the Mithras cult as a cult that developed during the era of the new empire, but denies any associations between the Mithras cult and the Iranian Mithra cult, except the name of the god. The author of this article is convinced that both the first and third positions have weak justifications. The author thus demonstrates, by relying on sources from Iranian and Roman culture, that the personality of Mithras in the Roman cult is very strongly associated with the personality of Mithra in Iranian religious heritage, which allows one to draw the conclusion that the Iranian Mithra served as the main prototype for the Roman Mithras. Mastrocinque, Attilio. 2017. The Mysteries of Mithras: A Different Account. (Orientalische Religionen in Der Antike). Tübingen: Mohr Siebeck. In this work, Attilio Mastrocinque cautions against an approach to Mithraism based on the belief that this mystic cult resembles Christianity. While both Christian and pagan authors testified that Mithraic elements were indeed borrowed, according to Attilio Mastrocinque this was only done by some gnostic Christians. He counters that Roman Empire ideology and religion provide better clues on how to approach the matter, contending too that Virgil proves to be more important than the Avesta in understanding Mithraic iconography. The meaning of the central scene – the Tauroctony – thus becomes clear when the Roman triumph’s central act of bull sacrifice is thought of as just that, with Mithras playing the role of victor as author of this success. The episodes depicted on many reliefs relate to a prophecy known to Firmicus Maternus and other Christian polemists, and which foretold the coming of a saviour, i.e. the first emperor, when Saturn returns and Apollo-Mithras will rule. Attilio Mastrocinque Born 1952; 1975 Master; since 2002 Full Professor of Roman History at the University of Verona; 2008–10 president of Cultural Heritage courses at the University of Verona; 2005–15 Director of the Archaeological Mission at Grumentum (Lucania). Elsner, Jas. 2017. Images of Mithra (Visual Conversations In Art And Archaeology 1). New York, NY: Oxford University Press. With a history of use extending back to Vedic texts of the second millennium BC, derivations of the name Mithra appear in the Roman Empire, across Sasanian Persia, and in the Kushan Empire of southern Afghanistan and northern India during the first millennium AD. Even today, this name has a place in Yazidi and Zoroastrian religion. But what connection have Mihr in Persia, Miiro in Kushan Bactria, and Mithras in the Roman Empire to one another? Mazdapour, Katayoun et al. 2015. The Religions of Ancient Iran. Tehran: SAMT Publication. This book is an introduction to Ancient Iranian Religions. 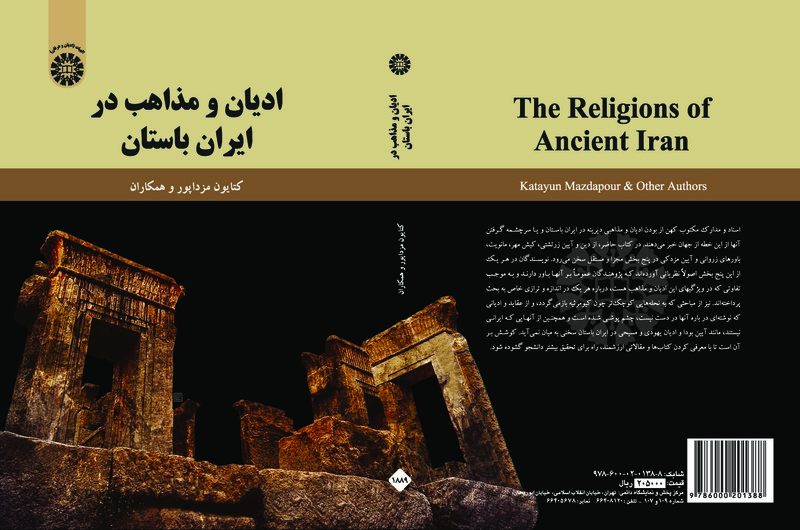 Each chapter of this book deals with one of the major religions or trends in the history of ancient Iranian religions or those religions which were influenced by ancient Iranian beliefs and views. Mazdāpur, katāyun va digarān. 1394š/2015. adyān-o maẕāheb dar īrān-e bāstān. tehrān: entešārāt-e samt. König, Götz. 2015. Iranisches im römischen Mithraskult: Iranische Wörter. In Richard Faber & Achim Lichtenberger (eds. ), Ein pluriverses Universum: Zivilisationen und Religonen im antiken Mittelmeerraum, 301–331. (Mittelmeerstudien 7). Wilhelm Fink. Tauroctony scene on side A of a two-sided Roman bas-relief. 2nd or 3rd century, found at Fiano Romano, near Rome, now on display in the Louvre. Götz König discusses the origin and roots of some “Iranian words” in Mithraism under the Roman Empire from linguistic and philological point of view . Begining with the question of “Mithra” or “Mithras”, he addresses the history of scholarship regarding of “Mithraic Studies” connected with ancient Iranian studies. Other sub-chapters of his article is dedicated to analytical investigation of some Iranian linguistic materials, namely the greeting nama, the terms sebesio and nabarze, as well as the divine names Arimanius, Cautēs/Cautopatēs/ ˚is, Atar, Ōromazdēs and Miθra and also the liturgical term amara. Götz König is a scholar of the Ancient and Middle Iranian Studies and presently the substitute head of the Institute of Iranian Studies, Freie Universität Berlin.